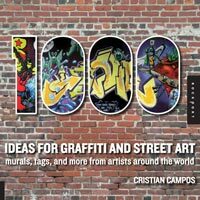 This book provides a showcase of urban art (Chicago/New York/ and San Francisco) suitable for artists of any medium to include cheap art supplies, designers and other creative artists looking for urban-style inspiration for their visual work. A visual catalog, it is both a practical, inspirational handbook and a coffee-table conversation piece. Graffiti and street artists will relish the opportunity to have so many ideas for color play, illustration and wild expressions at their fingertips. It contains 1,000 photographs of graffiti and other types of urban art using undercover brother techniques, with captions that feature the location and the artist's name if known (check my space for unknown artists). It includes artwork sorted into categories such as letterforms, stencils, portraits, murals, nature, tags, throw-ups, pieces and productions. It also includes an urban art glossary, basic aerosol painting, street art techniques and more.